CD's do still have a place in my world. Sure, I'd never buy one if there is a vinyl version available, but I'd rather buy a hundred CDs than one cassette. At this point I can't imagine it's more expensive to do a cheapo CD than to do a cassette. I haven't price checked either, but you'd think the CD duplication process would be a lot easier. 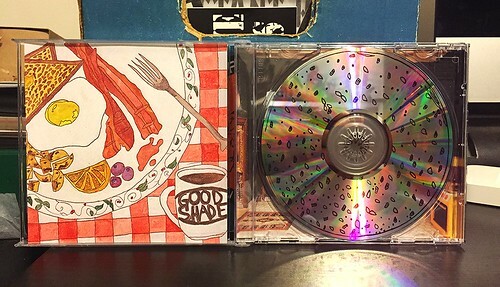 Regardless, even though I wish this new Good Shade album had been released on vinyl, I'm glad they avoided the tape route and went with a good old fashioned CD. Good Shade is a band that is flying way under the radar and that's a damn shame because this is the second straight album they've released that just rips from start to finish. Good Shade is the brain child of Shane Natalie and he plays all of the instruments on this album. He was also in Tight Bros, a band that I really dig. I'm not sure if they're still together though. Anyone know? Anyway, Breakfast is a non stop attack of hooks and buzz saw guitar. A little bit Marked Men and a little bit Sonic Avenues. I could certainly see this album on Dirtnap and it definitely deserves that kind of exposure. 2016 has been something of a lackluster year for new albums so far, especially truly great, fun pop albums. This is the sort of record that turns your entire year around. Breakfast is a top tier punked out pop album and it really should be picked up at all costs (and actually the cost is ridiculously cheap on the Good Shade Bandcamp page, so there's really no excuse). Oh, there's also a little note in the CD artwork that just says "1 of 3" with no other info. Could that mean Lunch and Dinner albums are on the way? I sure hope so.